Maybe it was a gag novelty gift, something to have a few laughs over with some friends? You know, kinda like ancient Japanese fart cushions? what next, they find an ACTUAL zanbatou like Sanosuke used (though admittedly nodachi are huge, they're nowhere near as ridiculous as the zanbatou was)? History is often far stranger than fiction after all. I just kind of figured that was a training sword thing, so that they could get used to the weight without actually hurting anyone. Learn something new every day. A training sword would have no sharp edges. This one has the edge on the opposite side. I'm no expert on swords, but what makes them so sure the sharp edge would be towards the wielder? To me this looks like a tool designed to be easily concealed, with a cutting edge curved to make drawing across a throat easier...assassin blade? Gag gift seems as good a guess as any. Other other "practical" use i could figure for it was if you had a neighbor or enemy that had a style that disarmed your short sword and used it against you, or something. 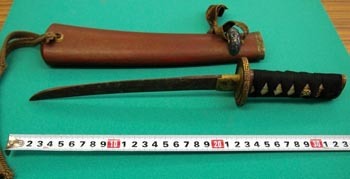 Short swords were generally indoor swords, some kind of anti ninja thing perhaps? strange find to be sure. A reverse grip style would be interesting with the curve like that. but any more interesting than a normal sword held normally in reverse grip? some mildly different parrying options maybe? Interesting, but I wonder why something like this would be used? The idea that it was meant to be a "reverse-blade" sword is pretty unlikely. More likely it was an attempt at a forward curving blade. Wouldn't this have uses outside of warfare and such? I mean woodcarving for example is, as far as I know, rather more precise (albeit more risky) when cutting towards yourself as opposed to away from yourself. Maybe some other craft where you'd have to cut towards yourself? Wouldn't put it past some nobleman of the age to invest a lot of wealth into a fancy looking tool for a hobby of his or whatever. Maybe even an expensive gift for a lady of the time, if those used knives for whatever purpose? Heh, new blacksmith in training failed his test by not knowing which side of the blade to make sharp. I'm going to guess that it's an attempt at an inverse blade, much like the Turkish yataghan. Actually a really good suggestion. With the curved blade towards the user all you need to do is slice it across the throat. Maybe we found an actual ninja weapon?